Yesterday HRH Princess Sofia wife of HRH Prince Carl-Philip gave birth to the couples' first child a boy. The name and title (with the following Arms) are yet to be revealed. At today's Council HM The King of Sweden announced that the new-born Prince will be named Alexander Erik Hubertus Bertil and will be Duke of Södermanland. For those who are wondering where Södermanland is, it is the county immediately south of Stockholm (indeed much of modern Stockholm is in Södermanland). Something else, non-Swedes need to know is that Södermanland is pronounced "Serdermanland", and more usually written Sörmland and pronounced "Sermland". Acctualy I have never heard it prounounced with an e.
Last edited by Marcus Karlsson on 21 Apr 2016, 19:59, edited 1 time in total. Marcus Karlsson wrote: Acctualy i have nerver heard it prounounced with an e.
I am trying to explain the pronunciation to our many non-Swedish members. the "Ö" in Södermanland or Sörmland is definitely not an "O"
I see, the Ö is hard to explain for those not familiar with the sound. Scroll down to the last letter of the alphabet and click the speaker icon! People in Dalarna were very disappointed that the the new prince did not become duke of their "landskap". Just because his mother came from there. Joseph; Thank you for that link, which I have bookmarked for future reference. Torsten: Yes many people from Dalarna were disappointed, in particular one school class filmed for TV news. For those members who are struggling with the recent flood of new Swedish Dukes and Duchesses, it may be small comfort that so indeed are many Swedes. From a low of one (Prince Bertil, Duke of Halland) when the present King came to the throne in 1973, the Swedish Royal Family now has no less than ten Dukes and Duchesses (including two - Prince Daniel and Princess Sofia - who are strictly speaking spouses rather than Duke and Duchess in their own right). The distribution of ducal titles has been, and continues to be, very uneven. Some provinces have had many, not least Södermanland, the latest grant, and Värmland. Others, including the two most northerly - Lappland and Norrbotten - have never been favoured. Why this should be is a mystery (at least to me). For more on Swedish dukes and duchesses, don't miss Martin Sunnqvist's talk at the Congress in Glasgow titled Coats of arms of Royal Swedish dukes 1500 – 2015. 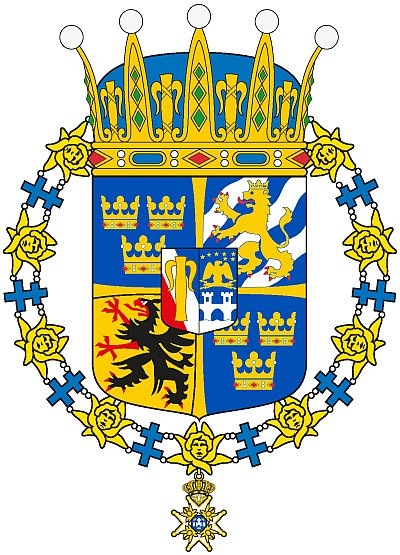 Nothing unexpected; the arms of Södermanland in Q3.